When I was 12 years old, my Oma & Opa gave me a beautiful hard-cover copy of Anne of Green Gables by L. M. Montgomery. I have loved reading ever since the first time I read it, and I still have that book in my collection. It's a large, heavy, hard-cover, 3-Volume copy that I have kept because of the sentimental connection it holds to my grandparents and because I know it's a book that I will read again, and read to my daughters. I do a lot of things on the computer or other devices, but until recently, reading wasn't one of them. So, when I was offered the opportunity to try out the new Kobo Glo HD, I thought it was time to give it a try. For one week, I set aside my paper books and took to the eReader! I wasn't sure how I would like it. I spend a lot of time looking at a screen in my life and books are one thing that I have been hesitant to move onto a screen. When I first got my tablet, I tried reading on it a couple of times but it didn't last long. I feel like reading is a way to escape from looking at a screen and to give my eyes a break from that experience. But I gave it a try on the Kobo and was so happy to find that because its screen uses different technology than a computer or tablet screen, it didn't strain my eyes at all and was just like reading a paper book (of course, without the page turning). Something else that I really love about it is that I can adjust the font, font size, line spacing, etc. so that the format is most comfortable for me! I'm excited about the purging possibilities that this eReader presents, too! I've been trying to get rid of excess "stuff" in my home, to de-clutter and simplify. If I start putting books on the eReader, I'll be able to make a big difference in the space that my library takes up. 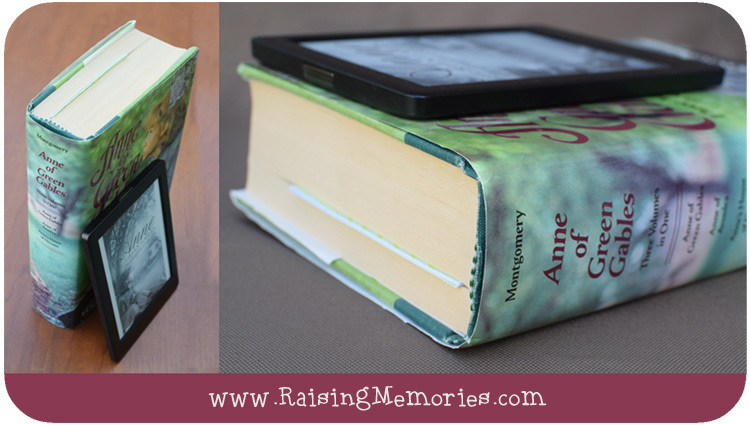 Just looking at the Kobo next to my copy of Anne of Green Gables, you can see a big difference in size (the Kobo Glo HD is just 6" x 4.5" x .35"). Now consider the fact that you can fit thousands of books on that little Kobo! I'm also loving how easy it is to bring the Kobo with me. If I were reading through that big book, I wouldn't bring it with me to read in a waiting room because of how big it is. I also wouldn't be able to relax in bed and hold it however I wanted to, comfortably. With an eReader, you can do those things with no problem! AND if I don't want to bring the Kobo with me, or I wasn't expecting to have time to read while I was out, I can pull up the Kobo app on my ipad or phone and just pick up wherever I left off because the app syncs with my Kobo! The Kobo Glo HD doesn't have to be charged very often- it has a battery life of up to 2 months, so you can read a whole eBook on one charge! One more feature that I'm a big fan of is the adjustable ComfortLight. When the light is turned off, it is like looking at the page of a book which is awesome for reading outside, even in bright sun because there's no glare! I like this because before the Kobo, whenever I wanted to bring a book to the park with my kids, I would get frustrated with pages blowing everywhere. I tried to solve that by reading on my ipod and just got annoyed with the glare. Now I finally have a solution! When I want to read at night when Ken is asleep, I don't have to turn on a lamp, I can just turn up the light on my Kobo (which is adjustable, so it won't be too bright because I can set it exactly as I want it). Getting books onto the Kobo is easy to do with their 24/7 eBookstore through Wi-Fi. You can also borrow eBooks through library websites! 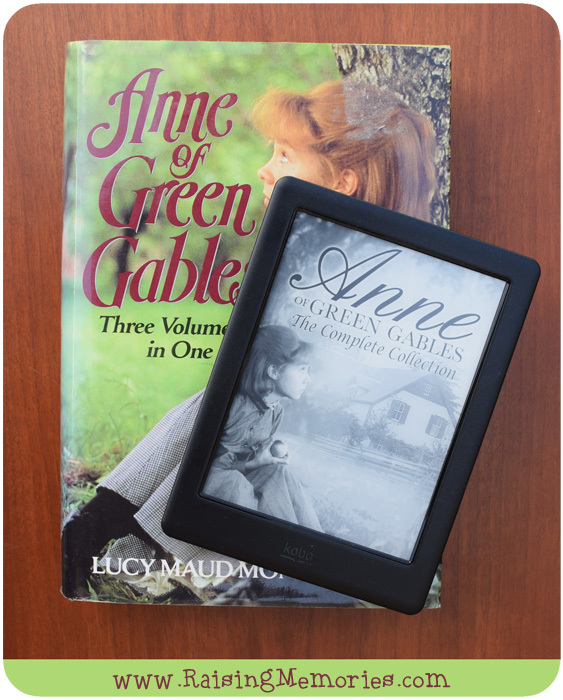 The Kobo will even give you personalized recommendations for your next book, based on what you've been reading. A feature I really like is that you can search the eBookstore for a book and when you find one you think you'll like, you can download a free preview and start reading to see if you think you'll really like it, before you buy it. And finally, it gives you fun facts and stats, like telling you how many hours you've read and how frequently you turn pages, etc. 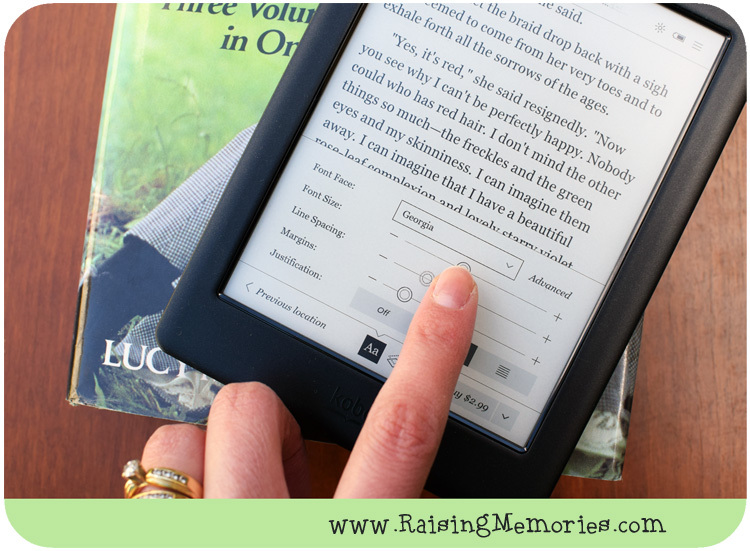 Maybe you can tell from the way that this post was written that I am a fan of the Kobo Glo HD! After 7 days, I can say that I'm converted! Will I throw out all of my books? No. I will probably hold onto that special copy of Anne of Green Gables as long as it's in good shape. There are some paper books that I wouldn't part with, but I will probably start to buy eBooks to avoid expanding my physical library too much! I've also tried borrowing eBooks through my library and I love the convenience of it! I was eyeing a series of large, hard-cover books that my mom has on her bookshelf, thinking how much easier it would be to read with the Kobo! I'm definitely excited about the possibilities with this eReader! Discount code is valid for 35% off select eBook purchases from this page and select lists. Discount will be confirmed at checkout. Offer valid until June 30, 2015 at 11:59 PM EST. This offer is not valid in conjunction with any other offer or promotion and cannot be used to adjust amount paid on previous purchases. Discount code must be entered at time of purchase to qualify for this discount. Discounts cannot be applied nor the discount value refunded once a purchase is complete. Rakuten Kobo Inc. reserves the right to change or cancel this offer at any time without notice. 200 Readers across the web will win a $10 Kobo gift card! Giveaway is open to residents of Canada (excluding QC) and the USA (excluding Alaska & Hawaii). I have really been enjoying my Kobo Glo HD as well. I love the idea of being able to pack many books with me and not having them take up space in my luggage! I admit to not having made the transition to e-reader yet, although there are so many good reasons to switch. It would be great to pack only the e-reader this summer, rather than a library of paper books! My eReader is probably the 1 product that has surprised me the most. I really thought I'd miss flipping pages of a book but the versatility of it far exceeds that need. I love the versatility my e-reader offers me but try as I may I have not been able to fully leave the feeling of holding a book. Like you I also use my reading time as an escape from a screen. Having said that, this e-reader looks fabulous for me to get for my daughter who has been asking for one recently. I had no idea that you can adjust the Kobo to your reading/viewing preference! What a great feature!! We have sooooo many books here, I'm starting to run out of places to put them. I'm really liking the idea of switching to ebooks. LOVE my Kobo reader and hoping to win one for my Husband. We travels at least once a month (and of course we winter in Mexico) so space is limited for books. Love to support Canadian as well. A Kobo sounds really nice, I like reading from a screen far better. I have gotten so used to it! I love the compact size of that Kobo! What a great little e-reader, and I love that I can support my local independent bookstore by using the Kobo. Great review. I have to admit that I am a fan of e readers and Kobo Glo is top notch! I would love to try one out. I have the Ipad, but it is a little big to read in bed with it. Thanks for letting me know about it. Ha, I have the exact same copy of Anne of Green Gables! I'm sorry to admit that I've never read the whole thing. I love the movies, though, and I know that I could make it through the books, now that I'm an adult.